This article was written by Helen Rumbelow and was originally published in The Times newspaper. Gabriella is a seven-year-old at a state primary school in Hertfordshire. But when her teacher asks her to put on a pair of giant gold heart-shaped glasses to read over her work, she is suddenly a child of the Russian revolution. All around Goldfield school are touches of a new teaching system adopted in September. The approach — pioneered by a psychologist in Moscow in the 1920s — has been rediscovered in the West. In the US it is now hailed by thousands of parents as a fast-track to success for their children. Greater research is being conducted to see if the dramatic advances seen in pilot nurseries are too good to be true. Suddenly, the life’s work of Lev Vygotsky — who died a pariah of Stalin’s regime — has found its moment. Vygotsky predicted the latest breakthroughs in modern psychological science 90 years ahead of time. At first as you wander around Goldfield, you don’t see much difference. Then I realise that I’m always asking Debbie Stevens, the headteacher, “how old are those children again?”, because I can’t quite trust my instincts. A group of three-year-olds solved the teachers’ block construction problem using concentration I would expect of six-year-olds. The six-year-old who I partnered in a game, firing numbers at each other to match a hand movement, left me a discombobulated mess. 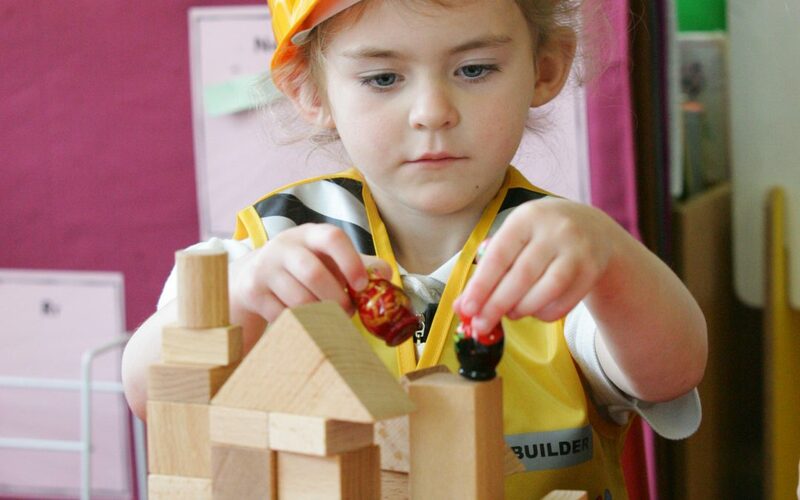 The construction team pretended to be furniture makers for their dolls, with the teacher wearing a construction hat as building inspector. Gabriella’s glasses made her a “newspaper editor”. The school has a dedicated role-play co-ordinator who refits each classroom every term, from the farm shop in the nursery to a Hollywood studio complete with showbiz reporters in the school’s final year. Play is everywhere, but not just any old play. Vygotsky’s big idea is to use play to teach self-control. At first this sounds a bit bonkers. But self-control is the new buzzword in educational psychology. A simple experiment known as the marshmallow test has been proved to be a better predictor of a child’s future than almost anything else. A child is given a marshmallow on a plate, but is told that if he or she can wait a few minutes before eating it, he or she will get another. The children who can wait do better in most aspects of life. Achievement is not necessarily linked to intelligence — although it helps — but to focus. One such study, by Clancy Blair of Pennsylvania State University, found that children who had above-average IQ and levels of self-discipline were three times more likely to do well in school than those who just had a high IQ. Educators tried to teach self-control in countless ways, then began to doubt it could even be taught. Vygotsky’s breakthrough was to realise that young children learnt focus, self-control, and self-motivation through play. In play, children “are a head above themselves”, he wrote, practising for the next level. If adults structured this process, amazing results could follow. When you mention the word play and schools you enter decidedly unplayful territory. Many in Britain have sided with Maria Montessori, a contemporary of Vygostky, who thought the best way to help the poorest children in her native Italy was through intense work. She kept play to a minimum, calling dolls “useless amusement”. Her ideas are popular from multibillion-dollar programmes such as Headstart, the early academic drilling for deprived children in America, to some elite private nurseries here. Vygotsky’s theories were suppressed in the Soviet Union from Stalin onwards. It is only in the past ten years that Western scientists have started to get excited about Vygotsky’s insights. Elena Bodrova, a disciple of Vygotsky from Moscow, is now his leading proponent in America. “Vygotsky was working just after the revolution. He thought he could change society: there were huge masses of illiterate people and it called for something very, very revolutionary,” says Bodrova, a principal researcher at Mid-continent Research for Education and Learning in Denver. Today, Bodrova says, Vygotsky would have diagnosed a different problem. Educationists I spoke to here and in the US all said that children were arriving at school less and less able to focus. “That is because today’s children don’t know how to play. Lots of research has shown that children spend less free time in make-believe, in social games.” Bodrova says. “Children who think they can’t write, will suddenly scribble on a pad if they are a waiters.” So long before conventional literacy and numeracy, comes “playing” at writing, and storytelling, and construction, in specific ways to create advanced thinkers capable of solving problems for themselves. Professor Adele Diamond, a researcher at the University of British Columbia, is the foremost expert on self-control in children. She visited the Vygotsky trial nurseries in America, and “it blew my socks off. When Diamond’s results showing dramatic improvement in a child’s self-discipline under the regime were published in the journal Science in 2007, it created a storm of interest. Now she is conducting a major trial on 4,000 children in Vygotsky nurseries in Colorado, following them up to the age of 12. But hundreds of pre-schools are adopting it already. “The previous programmes did not work on cognitive skills such as attention or self-control. They drilled in academic knowledge, but when they stop doing that, you don’t see any more benefit,” Diamond says. In this country, Vygotsky has had a slower start, because schools are constrained by the national curriculum. Madeleine Portwood, an educational psychologist in Durham, tested the storytelling aspect of Galina Dolya’s Key to Learning programme in two nurseries, with 130 children, for a year.